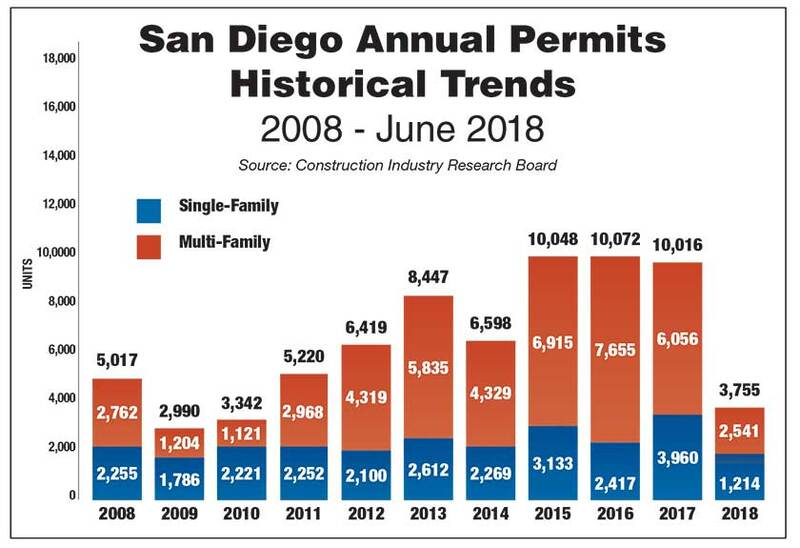 San Diego  Low vacancy rates are keeping the San Diego region’s multifamily market strong for real estate investors, but builders warn that not enough middle-wage units are being built to keep pace with population growth. Because of the high costs associated with building regulations, profitability for builders is at the high-end multifamily construction, Winckel said. After obtaining land and government permissions to build, creating housing for low- and middle-wage households often doesn’t pencil out. In order to build multifamily structures, builders often must go through the process of having land rezoned, she said. According to a recent market overview report by JLL, a shortage of developable land and the region’s growing population have combined to create the strong market. The report forecasts that multifamily housing growth will continue to lag behind the population growth throughout 2018. New attached-home rental units are almost exclusively at the high end of the market, said Ray Adams, a managing director for Cushman & Wakefield. He noted that downtown San Diego “has the most building by far” of multifamily units. Rents of $3,000 to $4,000 per month for two-bedroom units are common. Multifamily property owners are benefitting from current market conditions, said Peter Scepanovic, senior vice president for Colliers-International. CBRE tracks how many multifamily projects of 100 units or more are in the county’s development pipeline. As of June of this year there were 99 such projects, representing an anticipated 32,280 units that are expected to be built through 2021. An estimated 4,538 units are expected by CBRE to open this year, compared with 2,229 in 2017.